Camera 1 works but camera 2 (the EXT position) doesn’t. Press the EXT button on the remote. Does the screen image change? Step 5 Place the camera cables back in their original position and move only a working camera to the EXT position. Do you get an image? Contact your INTEC Service Rep. They may ask you to return your camera for service. Check the camera cable for damage. It may need to be replaced. 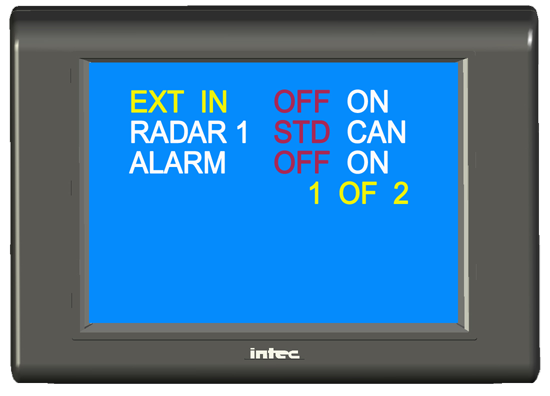 Step 6 Contact your INTEC Service Rep. They may ask you to return your controller for service. Note: When using a CVS102 controller you must use the CVR100 remote. If you are not using the correct remote replace and retest. Once you've accessed the installers menu you will already be on EXT IN. Simply press the "Up" arrow button. ON will now be highlighted. Press the EXT button and your external video input should now be displayed.